They like to note the weather. THERE IS NOTHING making headlines and capturing emotions right now like the water charges debate. The growing opposition shows no signs of abating. The Government is hoping to reverse this trend later today with the announcement of a range of revisions to their plans. The massive protests that took place around the country caught the attention of international media, as until now the Irish had been quietly riding out waves of austerity measures for years. Some have carried reports in recent days about the protests and opposition. NBC’s Tracy Connor describes how a mother-of-three was attempting to prevent water meter installers stepping on to their neighbours property, refused to move when asked by gardaí, and was taken into custody. It also details the system of ‘spotter cars’ set up to track Irish Water vans and like other articles points at the attitude of ‘there’s nothing left to pay’ as the reason the spots of unrest. Oh, and of course, it notes that Ireland is rainy. The co-ordinated tracking of the utility’s vans and workers is also touched by on Bloomberg’s Dublin bureau chief Dara Doyle in his piece. Again, the opening describes a protester who has been arrested for the sixth time. Doyle spoke to Michael Breen, a politics lecturer at DCU, who believes the recent wave of localised unrest “could potentially bring the Government down”. Again, it is noted that it rains in Ireland. Writing in the Financial Times, Vincent Boland decided to leave our weather out of it. He quotes Right2Water official Brendan Ogle describing the opposition as ‘unprecedented’. It highlights the massive scale of the Irish Water project, and how we’ve fallen very much behind OECD countries in not introducing domestic water rates. The Tánaiste’s lengthy run-in with protesters in Jobstown at the weekend also made the headlines across the Irish Sea. The bomb threat by Minister for the Environment Alan Kelly also caught attention abroad. Wire copy from Reuters has appeared on a number of EU websites, and even Pakistan’s Daily Times. Two journalists from NPR are also snooping around today – but what are they up to? Email “'Relentlessly rainy Ireland': How water charges anger is reported abroad”. 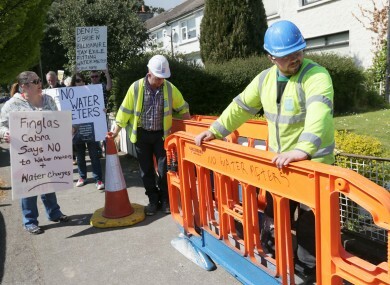 Feedback on “'Relentlessly rainy Ireland': How water charges anger is reported abroad”.